Was Obama Right about the Green Dream? In 2008, President Obama pumped major hope into the green energy sector. It was a popular thesis, promoting a sector that people could feel good investing in. It became chic to say you were a green energy investor. Unfortunately, reality hit hard for the green energy sector by the end of Obama’s first term, and he distanced himself from the billions in write-downs. But was he wrong? The renewable power sector over the last year has become well known for its “yield cos” as large companies such as First Solar, Sun Power and Sun Edison break apart their organization into several pieces. The parent company builds and finances the projects, while the spin off company known as the “yield co” is the operator. Agreements are formed with municipal governments and power generation is sold at a fixed price, usually over a 20+ year period. As a result of their stable cash flows many of these companies become dividend payers. In a world of ZIRP, it’s not hard to understand why investors have been drawn into the yield cos. 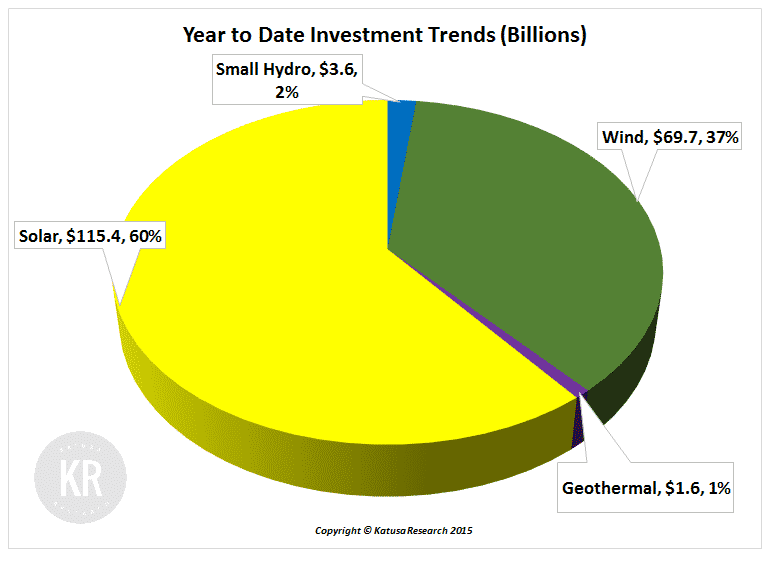 The renewable power generation sector is far more than a flash-in-the-pan investment, despite much talk lately that the yield cos are unsustainable. While some growth trajectories are arguably aggressive, the hypothesis surrounding the sector has not changed. My concept of “innovation through necessity” does not just apply to the likes of the US onshore shale players, but also to green energy generation. Doing more with less has long been a goal for the energy sector, reducing the carbon footprint in as many ways as possible. Bans on low calorific or “dirty coal” started the movement and now renewable and clean tech is the next part of the cycle. I spoke at Dave Iben’s Kopernik Fund meeting earlier this week in New York, and I was asked a question about which energy sector will experience the greatest growth. My answer without hesitation was the economic green energy space. In 2004 global annual investment in renewable power generation was under $35 billion, in 2014 annual investment was a staggering $263 billion. These investments are inclusive of both government and corporate spending, while being exclusive of M&A activity. On a year-to-date basis, investment has been extremely strong and the sector will finish for the 6th year in a row with new annual investments of more than $200 billion. Technology has allowed us to improve the efficiency of renewable power significantly. Furthermore, with the push towards lower carbon emissions, the cost of electricity generation from coal-fired plants has nearly doubled since 2009. The result is that in many parts of the world, renewable power is as or more competitive than coal fired generation. 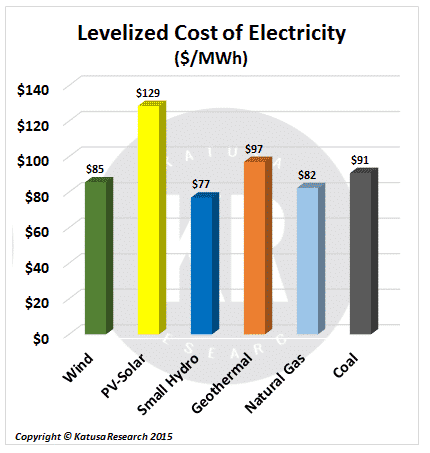 To the right is a chart of the costs to produce 1 MWh for each major electricity source (Q4/14 data). It’s hard to believe, but North America is playing catch up with the rest of the developing world when it comes to green power. The US is not #1 in the green space, and perhaps that bugged Obama. Or perhaps he was just paying political lip service. Either way, the data below shows that Obama had a point. The cost to produce a single MWh has dropped from over $300/MWh down to $129/MWh. Technology has played a significant role in the cost reduction, as has the increase in government subsidies for solar power. The end result is a dramatic ramp up in the quantity of solar being used to power countries. 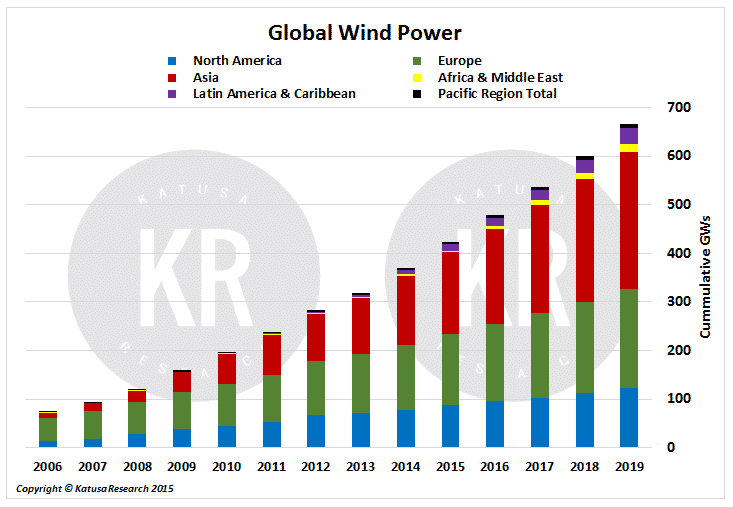 Long-time renewable producer Germany this year will be overtaken as Asian nations have a seemingly unslakeable thirst for power. Global solar power is expected to grow by nearly 300% to 540GWs in 2019. The Chinese are putting billions into the green space. The “airpocalypse” is a real concern to the people, and the government is moving full force to diversify away from coal, the largest provider of energy (and worst polluter) in China for the last few decades. Double Double? Moreover, China has just increased its legal birthrate to 2 children from 1. Depending on whom you ask, this move can be seen as positive or as too little too late. One thing that is sure, though, there will be more babies. And that means more power consumption. 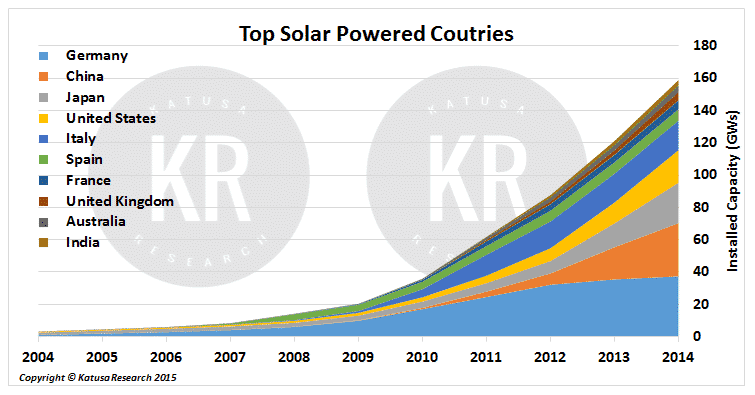 Solar growth has been exponential in the developing world and most notably in China. 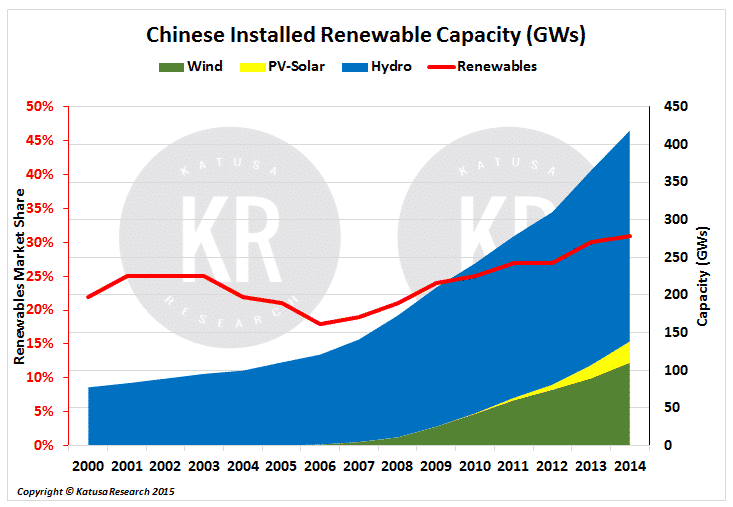 The Chinese have grown capacity at a rate of over 4000%; in 2010 they had 788 MWs of PV-generated electricity, in 2014 they had 33GWs, and they are forecast to have over 50GWs by the end of 2015. This will make them the largest solar power producer in the world. 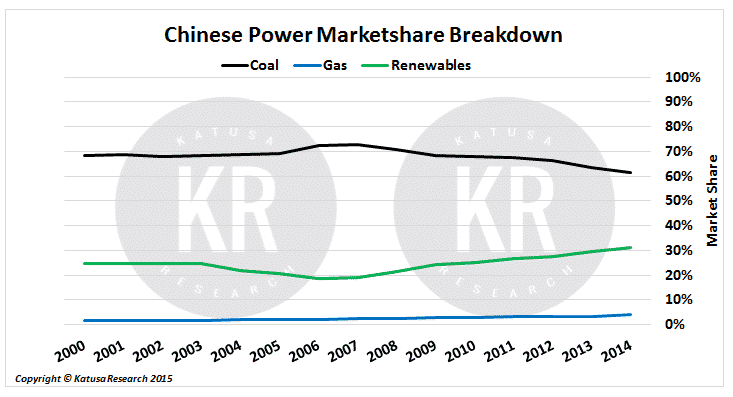 US: Coal to Gas vs. China: Coal to Green Energy In the United States the big theme over the last several years was power generation plants substituting natural gas for coal-fired plants. The Chinese, though, look to be jumping straight from coal to renewables, rather than creating an intermediate gas stage. 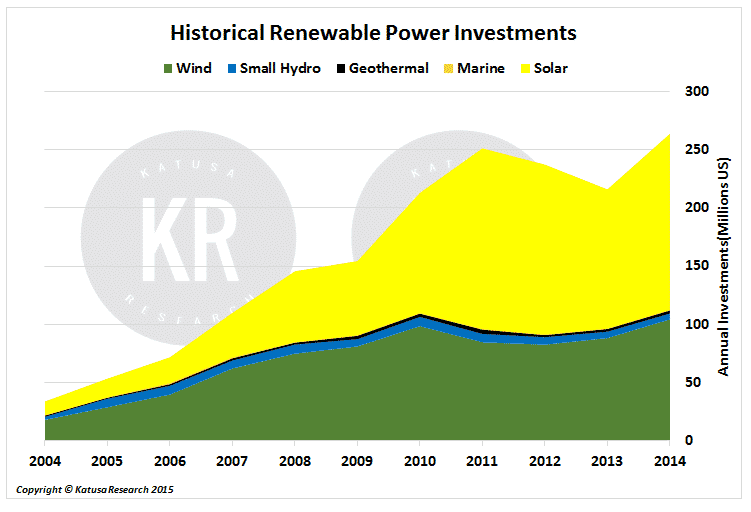 This is a huge win for the international renewable power players. The key point to take away from this week’s missive is that when we invest in renewable energy, we have to think long term. 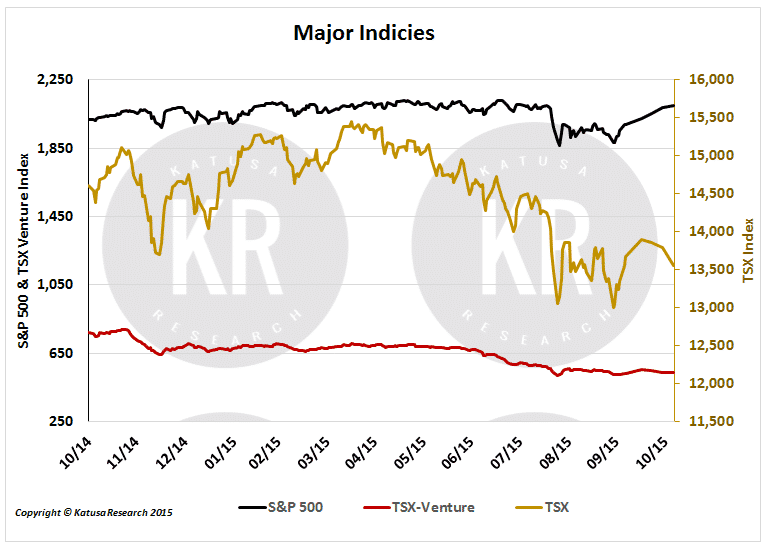 We have a tendency to get caught up in analysts’ 12- and 24-month price targets based on short term fluctuations. 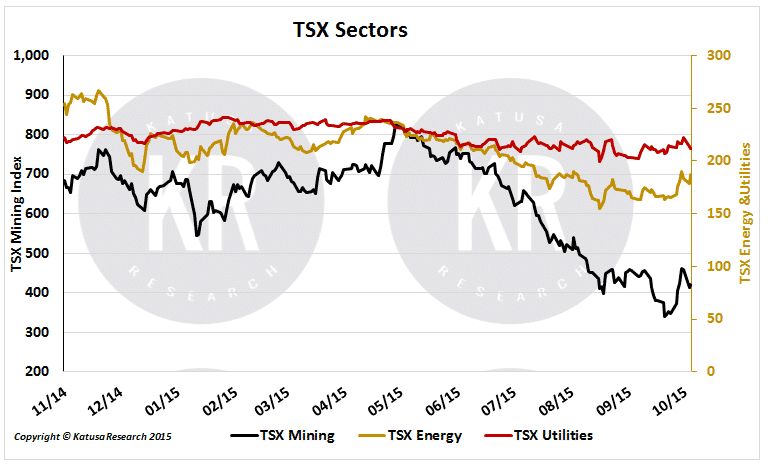 That’s what is happening to the yield co sector right now. But this lack of a proper perspective begs some questions. Are California and Texas going to stop their solar and wind production? No, they cannot afford to. Is Chinese demand for power slowing? No. If anything it is going to increase more rapidly. The company I have made my green energy bet on—Alterra Power—doesn’t even fit the true yield co model, since they do not yet pay a dividend. But I believe next year is the year, with a huge new project coming online which will boost EBITDA. There will be ample room to pay a competitive dividend and shareholders will be rewarded handsomely for being in early.